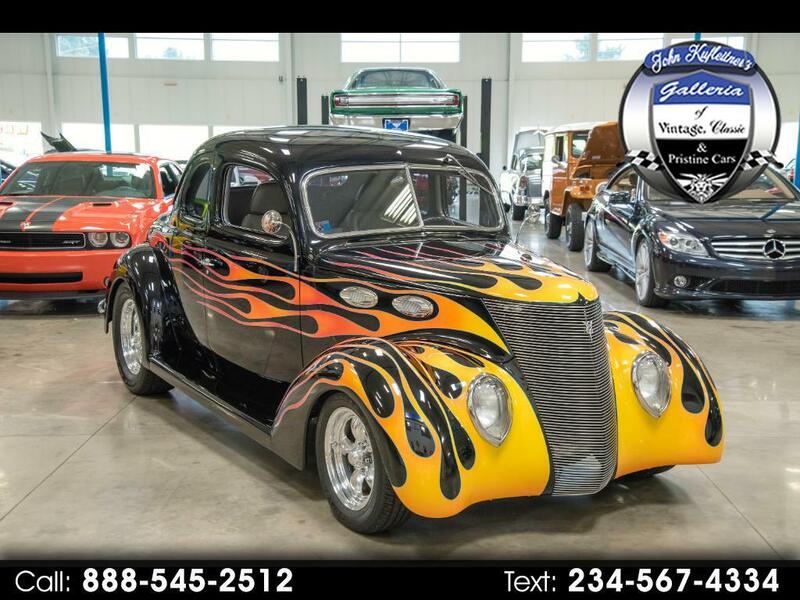 This is a Pristine Steel Body 5-Window Coupe with less than 2,500 miles on it since completion. This car has been rotisserie built and fully restored with no expense spared. Powered by a ZZ4 350 with 355hp and Rossler built TH350 Automatic Transmission and Ford 9" Rear End. Heidt's Mustang II Front end with Power Steering, and Power front Disc Brakes. Stunning Interior with Tilt Column, VDO Gauges, Custom Autosound Head Unit with Sony speakers, Leather trimmed seats that are heated, Vintage Air Conditioning with Heat and Defrost. American Racing 15" Front and 17" Rear Wheels wrapped in Goodyear Eagle Tires. The Body is steel and laser straight the fenders and running boards are glass but you cant tell without a magnet as the fit and finish are top notch plus paint on this car is just stunning! This car is fully dialed in and ready for a cross county trip. Message: Thought you might be interested in this 1937 Ford DELUXE COUPE.